The risks your organization faces are highly complex. The tools and expertise available to you are scarce. Our security experts at Optiv help you to understand and account for all types of risk, from the mundane to the catastrophic. 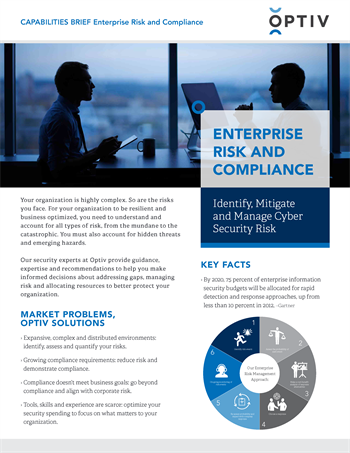 Learn how Optiv’s enterprise risk and compliances services can address your gaps, validate compliance, reduce organizational risk and optimize your security spend to focus on what matters most to your organization.